The kangaroo rat is a small rodent, native to North America, who is part of the genus Dipodomys. What makes this desert animal species unique is hinted at in the name. When they hop on their back feet, they look very similar to a kangaroo. Most of the 23 species of kangaroo rats can be found in California (including the Banner-tailed and merriam's kangaroo rat) and in other areas where it is hot and dry. Reasons why they can live in a desert-like environment are due to several special adaptations mentioned in the list of facts below. Click here for a great selection of Amazon.com books about Kangaroo Rats. They can be found in soft or sandy soil, grasslands, scrublands, and creosote flats. They are either light brown or grey in color with a mostly white underbelly. They have small front legs and large hind legs with four toes. They have very long tails and large heads with small eyes and ears. They are able to store food for long periods of time in their cheek pouches, which are lined with fur. Kangaroo Rats can only be expected to live for approximately 2 - 5 years. The males are larger than the females in all species of Kangaroo Rats. The Banner-tailed Kangaroo Rat is one of the largest species. Kangaroo Rats bury their nose in their fur in order to form a little space where moist air is trapped. This helps to reduce the amount of water lost during the respiration process when sleeping. 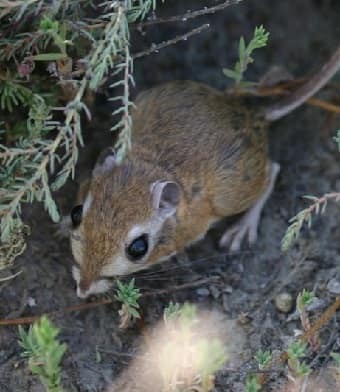 The Kangaroo Rat's main defense against predators such as owls, weasels, snakes, foxes, badgers, and coyotes are their long back legs which allow them to leap 7-9 feet (2.1 - 2.7 meters) off the ground and completely change direction upon landing. They have extremely good hearing which also helps them avoid predators, especially the owl, which is almost completely silent when hunting. Like Kangaroos, the Kangaroo Rats have pouches, only they are not used for carrying babies but rather for carrying food back to their burrows. They live in highly organized burrows which have separate areas much like a house would. They have individual chambers for eating, sleeping and storing food. To keep cool in their burrows during the day, they close up the entrance with dirt or soil. It is removed at night when it is cool enough for them to leave. The are very sensitive to drastic changes in weather and will stay in their burrows during inclement weather and harsh temperatures. Kangaroo Rats live in colonies with anywhere from a handful of dens to hundreds, depending on the amount of available food. They have the ability to convert the seeds they eat into much needed water. They have kidneys which function effectively ridding the body of waste while losing very little water. Most animals pant or sweat to help keep cool, but it would cause the kangaroo rat to loose too much water so they do not cool off this way.